The standard-width windshield assembly. Replacement windshields are also available, making it easy to change your windshield to match changes in weather or attitude. Height is measured from top of headlight cut-out to top of windshield. Only one of each available. Genuine Yamaha accessory part. 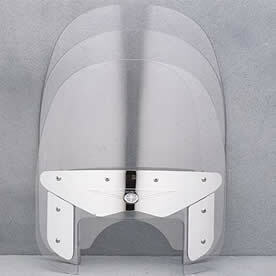 Part Number: STR-5GA06-10-00 Short Windshield 17 1/2"
Part Number: STR-5GA03-10-00 Tall Windshield 23"